McAllister Equipment to Auction New and Recent Volvo and Doosan Equipment May 24 and 25. Unprecedented Multi Million dollar offering of NEW, DEMO and RENTAL Fleet from one of the largest Volvo Equipment Dealers in North America featuring as New as 2017 construction equipment including Articulated Haulers, Loaders, Graders, Rock Crushers, Excavators, Skid Steers, Compactors, Generators, Air compressors. 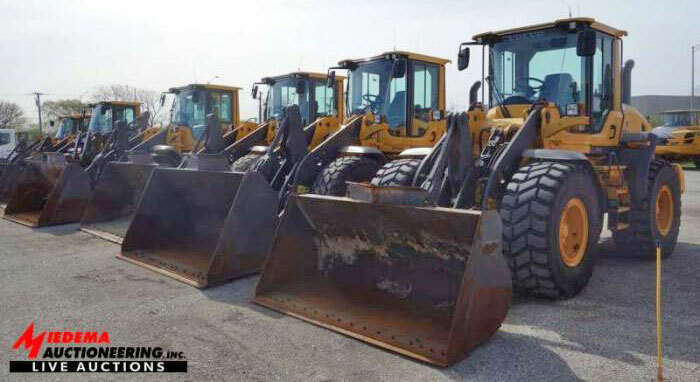 McAllister Equipment Co., an Illinois-based company founded in 1955 and one of the largest Volvo/Doosan equipment dealers in North America, will be auctioning a wide selection of Volvo and Doosan equipment, much of it new, lightly used and “like new” demo equipment. The assets will be available for a two-day webcast and onsite auction May 24 and 25. The website and onsite auction will be conducted by Maynards, a leading player in global asset auctions, liquidations and asset valuation appraisal services since 1902, in conjunction with Miedema Auctioneering and Appraisal, and Biditup. Assets include articulating haulers to 2013, excavators to 2015, rubber-tired loaders to 2015, telescoping forklifts to 2016, aggregate equipment to 2016, compactors to 2015 and light towers to 2016. Additional items include more than two dozen Doosan P185 compressors; a large selection of attachments and tools; shop equipment and a variety of service vehicles from McAllister’s five locations. • 2007 VOLVO BL70 12.5/80-18 19.5Lx24 Tires. Hyd. Pilot Control System, Air Conditioning, 740 lb. Counterweight. 4WD Power-shuttle, Standard Backhoe. 92.5″ 1.0 cu. yd.